There are five different grades of walk on the Friends of the Heysen Trail walk programme, catering for people of different fitness levels. Four of these operate during the walk season, generally from April to November when it is not Fire Danger Season. When it is not walk season, generally during the summer Fire Danger Season, only the Summer Twilight Walks operate. Walks are subject to you wearing appropriate clothing. Prime considerations are warmth and weather protection. Your safety and the safety of the walking group can be jeopardised by you wearing inappropriate clothing. In an emergency situation it can take hours to evacuate a sick or injured walker. In the interest of the safety of our walk groups, it is our policy that walkers must be 10 years of age or older and able to walk the planned distance. Leaders may not accept people for a walk who have not come appropriately dressed or prepared. These requirements generally do not apply to Summer Twilight Walks. The aim of these walks is to introduce people to bushwalking, for those who are not regular walkers and those who have not walked in a group previously or who want a shorter walk. TrailStarter walks are usually close to Adelaide, have a walk time of about 3 to 4 hours and will generally be not too physically demanding. Anyone undertaking these walks may have only a modest degree of physical fitness. These walks generally occur on Saturdays or Sundays. These infrequent walks are for specialist events like bird watching and historical walks; and would by their nature be relatively short and informative. 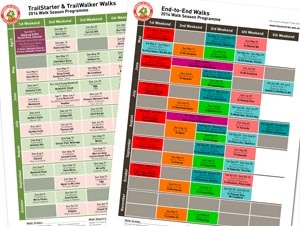 These walks are available to all levels of walkers. A major project to upgrade the Heysen Trail to a uniform high standard, including re-marking to current standard, stile work and track clearing. Huts, tanks and toilets are to be progressively improved. Weekend trips throughout the walking season of small groups of volunteers to conduct maintenance. By focusing on each end-to-end section the whole trail can be attended to over a five year cycle. Refer to the End-to-End Maintenance Weekends page for more detailed information.